I know, we spend so much time telling them NOT to play with their food and here I am telling you to encourage it. Listen my friends, candy is a powerful motivator! 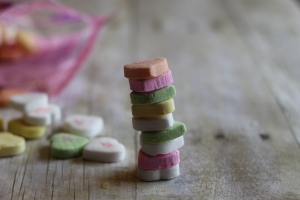 I especially love using these conversation hearts in these games because they don’t get as gooey or melty as some other candies do! These games and activities are easily adapted to toddlers and preschoolers to upper elementary students, making them great for multi aged groups. You can do any of these games with very little prep time OR you can get really creative and use the computer to print up worksheets. 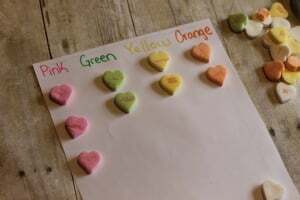 Create a chart by writing the color names at the top of a piece of paper, have your child draw candies out of the bag and place them in the correct column. Ask questions to make them think. What color is there the most of ? The least? Little ones can point to each one as they count, reinforcing one to one correspondence skills. This activity is great for building fine motor and hand eye coordination. How high can you build your tower? Older children can also use a ruler to measure how tall their stack is. Have them build 2, 3 , or more wide and see if they can make a more secure structure. Use different containers, have your child guess how many will fit, fill the container, and count the actual number. How far off were they? Can you fit more by filling it in a neater fashion than haphazardly? Not every activity needs to be glaringly educational, some can be just for the sake of fun (however this one sneaks in some strategy). 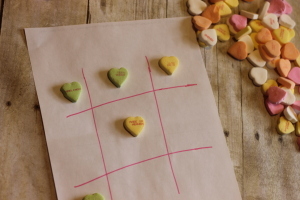 Draw out the tic tac toe board quickly and then each player chooses a color to represent their marker. 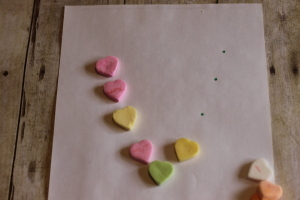 Make dots to form the outside of letters or numbers and demonstrate to your child how to use the hearts to form the letters. Repeat the name as you build each one. For older children you can write spelling words on a paper, call them out and have them cover the word with a candy marker as you quiz them. This next game is fun as an ice breaker or just to get everyone up and moving! 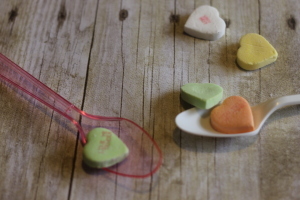 Load one heart on a spoon and race a predetermined path. Make an obstacle course, set up silly rules like walking backwards, hopping over the dog, etc. 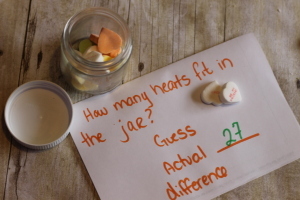 You can even place a jar at the end of the course and see which team can get the most hearts to the jar the quickest! 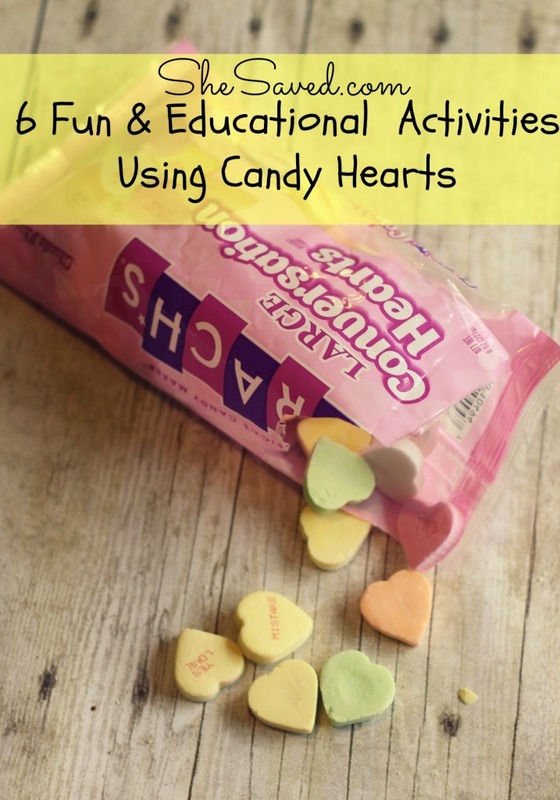 Make sure to check out all off my other fun Valentine’s Day activities, snacks and ideas!